I want to say all the people who ride or have ridden bikes are men so I am embarrassed to admit to them that my bike is kind of heavy for me. I got a 1979 Vespa scooter and it knocks me down. I have a devil of a time lifting it back up and I'm having trouble getting getting the kickstand to work for me. I'm all bruised up and quite sore. This is the second day I've had it. Any suggestions appreciated. Tip for putting bike on center stand. If you put a piece of wood under the rear wheel, it will be easier to put the bike on the center stand. Try a 1/2 inch or 3/4 thick piece of wood, if that is not enough, try 1 inch. Store it on the bike so you can use it even when you are not home. Also, the more time you spend practicing driving it, the more you will feel comfortable with it. Very pretty bike. Even though there are a lot of men riders, there are just as many women riders. Don't let that stop you. You will get so much out of the riders course if you have not taken it yet. When I took my course, it was split half men and half women. You defeat the bike, don't let the bike defeat you. Good Luck and be safe. Jennifer - Don't give up. It takes a lot of practice before you feel comfortable. Those center stands can be a stinker. 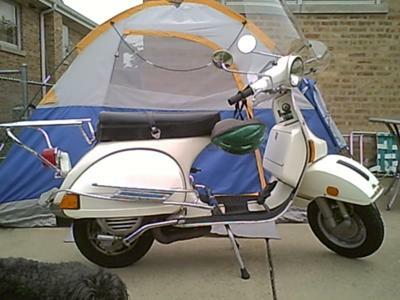 I think your Vespa is very cute! I'm sorry you're having some issues with your bike. Even though you are riding a scooter, have you taken the MSF Course? I took it last year, and just purchased my 1st bike. I am amazed at how I am constantly applying the principles I learned in class as I ride. This class will help you learn balance, learn to control your bike when turning, and proper stopping techniques.